How Do I Pay for Long-Term Care? The LeadingAge Kansas Foundation was formed in 1988 to conduct research, and produce information and training to increase the understanding of aging, and to improve the quality of care and services for older Kansans. The organization has been the recipient of millions of dollars in grant funding from agencies as diverse as the Kellogg Foundation, OSHA, the Kansas Health Foundation, United Methodist Health Ministry Fund, The Academy of General Dentistry, the Sunflower Foundation and the Kansas Department on Aging. It has provided cutting edge training to thousands of aging services professionals which have resulted in measurable improvement and change in long term care practice around the state. It has produced a wide range of groundbreaking reports on trends in aging and disability demographics, the economic impact of not-for-profit retirement communities in Kansas, the root causes of staff turnover in Kansas nursing homes and other topics. Most recently, the Foundation has focused on workforce development and providing scholarships for individuals working in LeadingAge Kansas member communities. To advance the health and well-being of older adults by providing research, education, training and the dissemination of information for providers of long-term supports and services. To be a knowledge generator and transformational agent for aging services. Engage in activities to support the priorities of LeadingAge Kansas, with a focus on workforce growth and development. 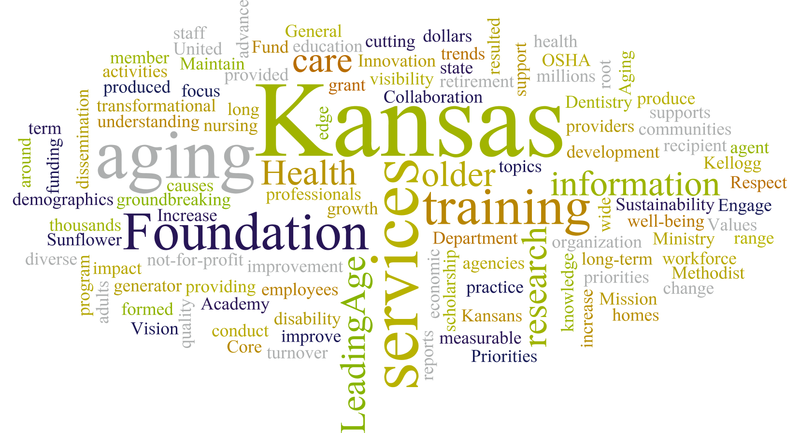 Maintain the scholarship program for LeadingAge Kansas member employees.